The Haven, a RM250 million lakeside residential project in Tambun, Perak, will set a benchmark for high-end developments in the state, said property developer Superboom Projects Sdn Bhd. 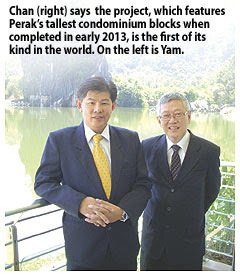 Its chief executive officer Peter Chan said the project, which features Perak's tallest condominium blocks when completed in early 2013, is the first of its kind in the world. The Haven comprises three 26-storey blocks of luxury condominiums with green features. It is aimed to be among the first development to embark on all feasible avenues of harvesting nature's renewable, sustainable resources such as wind, water, bio-gas and pro-active mechanical resources to power and maintain common areas, Chan said. Each block will offer 165 units overlooking a 1.6ha private natural lake with running water, a 14-storey high monolithic limestone rock formation, and the existing 280 million-year-old limestone hills. "The Haven is a distinctive development with trappings of luxury and functionality. It will be an icon for Ipoh, with a picturesque setting crafted by mother nature. No projects in the world will be able to replicate The Haven, not at least for the next three to five years as land with natural settings is scarce," Chan claims. The Haven was unveiled yesterday at the company's showhouse in Tambun. So far, 30 per cent of the Block A units have been sold. The units, priced from RM250,000 to RM1.4 million with sizes ranging from 958 sq ft to 4,345 sq ft, comes in 12 variations and have attracted buyers from Hong Kong, Vietnam and Singapore. "We believe we are launching The Haven at the right time as the market for high-end products in Ipoh is picking up. There are more people from Kuala Lumpur, Penang, and foreigners looking to buy condominiums in Ipoh as a getaway," Chan said. The developer will launch the second block when sales at Block A have reached 80 per cent, said the company's co-principle David Yam. SP SETIA Bhd, the country's biggest property developer, says its target of RM2 billion sales this year will be driven mainly by projects on the home front. "About RM1.9 billion will come from Malaysia and the remaining RM100 million from Vietnam," SP Setia president and chief executive officer Tan Sri Liew Kee Sin said yesterday in Kuala Lumpur. He was speaking at a corporate luncheon on the property sector, organised by Malaysian Industrial Development Finance Bhd. The group has already achieved RM608 million sales in its first quarter ended January 31 2010. On average, SP Setia's annual sales of nearly RM1.2 billion come from residential projects in the country. Some of its key developments in the Klang Valley are Setia Alam and Eco Park, which saw sales of RM238 million and RM197 million respectively in the first four months of the financial year ending October 31 2010. Liew said that SP Setia's sales represent less than 5 per cent of the total market and he hopes to increase this share by ensuring that the group maintains its sales growth of 20 per cent a year. He foresees the Malaysian property market being resilient despite an expected normalisation of interest rates in the next one to two years. 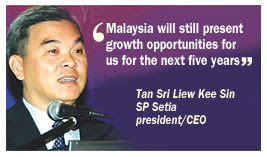 "Malaysia will still present growth opportunities for us for the next five years. In five years, we will be able to grow in China and Vietnam after the initial learning costs," he said. The developer has invested some US$12 million (RM39 million) for land title rights in Vietnam and allocated US$30 million (RM99 million) for its developments in China. While remaining focused on its projects in the Klang Valley, Johor and Penang, SP Setia also sees potential in Sabah from the Sabah Development Corridor. In addition, the developer is hoping to launch its key catalyst, the KL Eco City development, in October. It will begin pre-launch marketing in three months. The "green" mixed development is located opposite the Mid Valley Megamall and is a joint venture with the Kuala Lumpur City Hall (DBKL), which owns the 9.7ha leasehold land in the Kampung Haji Abdullah Hukum area. "We will address infrastructure concerns such as traffic flow. More details will be provided in time to come," said Liew, who declined to comment further. KUALA LUMPUR: TALAM CORPORATION BHD 's net profit fell 76% to RM4.54 million in its fourth quarter ended Jan 31, 2010 (4QFY10) from RM19.09 million a year earlier mainly due to a reversal in its finance cost upon the completion of its restructuring and settlement of debts under a regularisation plan. Revenue fell 49% to RM72.88 million from RM143.91 million while earnings per share (EPS) dropped to 0.23 sen from 2.97 sen.
For the full year, Talam's net profit fell 88% to RM7.09 million from RM59.11 million a year earlier. Revenue fell to RM250.98 million from RM301.28 million while EPS declined to 0.36 sen from 9.39 sen. No dividend was declared. It said revenue had fallen on the back of lower progress billings generated from its development projects, adding it would continue to complete its outstanding developments and continue to dispose of land and properties that exceeded its requirements. Talam also said it would apply to Bursa to lift its Practice Note 17 (PN17) status "soon" as its last few defaulted loans with its lenders had been settled. Meanwhile, KUMPULAN EUROPLUS BHD (KEuro), which is 25%-owned by IJM CORPORATION BHD, posted a net loss of RM5.3 million in its 4Q versus a net profit of RM3.83 million a year earlier. IJM also has a 26.73% stake in Talam. This came following a significantly smaller share of results of associates at RM1.05 million for FY10 from RM11.38 million. Revenue was slightly higher at RM10.18 million from RM8.37 million a year earlier, which was offset by higher sales costs. Loss per share was 1.10 sen from 0.80 sen previously. No dividend was declared. For the full year, KEuro posted a net loss of RM33.08 million versus a net profit of RM11.24 million in the previous year. Revenue was 5% lower at RM41.57 million from RM43.95 million previously while loss per share was seven sen from earnings per share of 2.4 sen. No dividend was declared. It posted a pre-tax loss of RM33.72 million versus a pre-tax profit of RM10.81 million in FY09 due to exceptional impairment of leasehold land, provision for liquidated and damages claimed by clients for previous projects, and a RM19.79 million loss from its partial disposal of investment in Talam which was mitigated by a RM37.07 million gain from a debt purchase transaction. Shares of Talam closed flat on Thursday, March 25, at 12.5 sen, while IJM closed eight sen higher at RM4.77. Meanwhile, KEuro lost 0.5 sen to close at 46 sen.